My garden is in full swing. I started seeds around March 20th, but thanks to crazy Indiana weather, couldn't plant them until last weekend. I had marginal success- they grew quickly but most fizzled out before I could get them in the ground. I had good success with the pepper seeds I planted- we'll see how they fare. 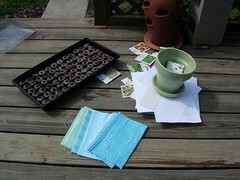 I also started tomatoes, cucumbers, squash, pumpkins, and herbs. I also direct sowed two types of beans and peas, and more of all of the above. I planted a ton of random flower seeds- Zinnias (Cut 'n Come Again, Pinwheel Mix, Purple), Cosmos (asst), Sunflowers (asst mix), Jasione, Gaillardia, Black Eyed Susan, lavender, and also a ton from my mom's house that she hadn't marked. We shall see! Finally, the bulbs I planted last fall are beginning to bloom. I'm a bit of an allium freak and found some on clearance at Meijer- most went by my front steps covering up the fading daffodils. Some Globemasters by my mailbox have yet to bloom. 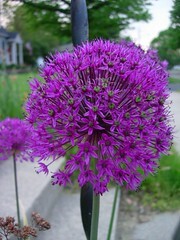 I read on GardenWeb that they self sow rapidly, and I am very much looking forward to a garden full of alliums!